Last week was one of my favorite week of the month. That's because we had 2 days break in between. It's like one day working, the other day off, the next day working and the following day off, that sort of thing you know. So it was fun and at the same time it makes me lazier. I was totally in a holiday mood. Therefore I wasn't that hyped to work at all for that entire week. On the eve of Deepavali, we (Mark, Nicole and I) decided to meet up for dinner and to catch up with our latest updates/news. So sad KM couldn't join us as his Dota is way more important than friends. Pfftt! Had our dinner in Pizza Hut. After Pizza we went to Calanthe for a drink. I really love this cafe so much. Especially the interior. They have quite of a collection on those old school stuffs. Just like these 'rotan' chair. My grandparents used to have one of these. Old records were pasted on the ceilings. Then we headed to Bamboo Hut Bistro for a second round. This time around, Presilia and Steven joined us. That was my very first time in Bamboo Hut. The foods and drinks are quite expensive. Had a great lepaking session with them. How I wish everyday is a public holiday. 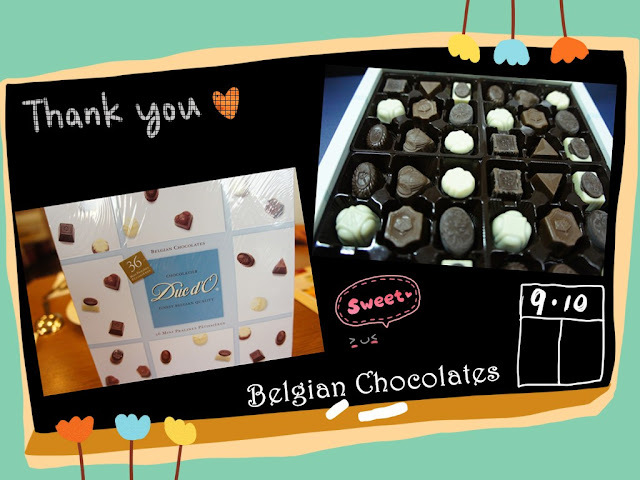 Received a box of Belgian Chocs from KM. Was supposed to share it with the boyfie but the greedy me took it all for myself.